Favorites? That is a hard question to answer. Personally, I find all the characters fun watch, even Pete and Bino who acted a villains (I say this because you never know) to lesser degree. Everyone is great, but I suppose my favorites are set like this. 1. Is a tie between Peanut and King. Both are great. King's story is very unique in itself and how he's adapted to it all is fun to see. Peanut is a lot of fun and feel like a representation of child like innocence. Plus, he's a cat lover (even if he said he's not) and I can't wait to see how that ends in the long run. 2. Is Sabrina. Not sure why, there's just something about her. I really like her personality and that air mystery around her. Also, can't help but wonder how she keeps her relationship with Fido. If I was her, I would go mad not being able to hang out with my lover in public. 3. Is Grape. She's great and I love her personality, but it feels like to she's at her best around Peanut. 4 Is Res. I can relate a lot to him for some reason. Plus, his fur patten is so cute. 5. Is Max. He's a lot like a friend of mine. Just more charming. 6. Is Tiger. I feel for him, I really do. Yet, I find him funny. 7. Is Fox. He seems different from a lot of the other dogs. Plus, he's a great friend to have. As for a least favorite, I have none. ^^ I find something to love about all of them. Last edited by Gray on Thu Jan 31, 2013 12:10 am, edited 1 time in total. Looky here, a thread I have not posted on yet. Well if anyone even had to venture a guess my Favorite character is Joey, but as for other favorite characters that is more difficult to decide upon. Since Rick does such a good job at portraying emotions and making characters it really is tough to pick who I like more. Last edited by Duster on Thu Jan 31, 2013 3:24 am, edited 1 time in total. Does Marvin have much of a personality? He just seems to me like someone for Tiger to play off of. 1. Fido. It just has to be Fido. I think I said a while ago that King was my fave, but Fido's just taken it for me recently. He's a police dog, probably one of the nicest characters out there, and has a funny little secret. Also, I think it goes without saying that Spo and Fido can't really be separated, so that wise-cracking mouse gets a freebie in the Number 1 slot for me. 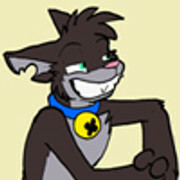 ATKM was printed in its entirety in the second Housepets! book. Oh you are right, his character is lacking to say the least but I remember them being in one of the first strips I read. So I guess you could say its a special case. Come to think of it, it would be nice if Rick developed Marvin's character more. Maybe him and Tiger could have a falling out of sorts, because let's face it Tiger is pretty crazy so it is bound to happen sooner or later. What is you favorite Housepets Character! Tell me your favorite housepets character and if you can why! Re: What is you favorite Housepets Character! I would say both Peanut & Grape because they're really fun characters. Merged into the topic in The Comic! 1. Fox, he will be my fav number one for ever. I would love to hang out with him for real, 'cause he is a great dog and I love his personality and his bandana is sooo cool! "my hunk sense is tingling"
Here's my definitive favorite comic characters top 10. People tends to underestimate minor characters because of their little roles, but everyone has a latent potential and when you least expect it, they become as popular or mainstream as any other protagonist, Sabrina and Fox are the (living) proof of that. Who knows? Maybe Marvin could be more popular than Max or Tiger if he got a chance. So, who is your favorite?.... C'mon tell us! Who is the charecter you like the most, Who would you like to see, (and if you want to) why? My favorite is Kevin, I feel like I share stuff in common, working out, can be alittle ditsy sometimes, being known to be funny, etc. We all have a favorite charecter, don't be shy to say, nobody will call anybody out. Re: Who is your favorite Housepets Character? 1. Grape. She has a past, a story that we do not know, and that intrigues me. As well as her attitude towards others, it always amuses me. She also reminds me of a good friend of mine. 2. Peanut. He is so happy-go-lucky and care free, you can't help but feel happy when you read his dialog. 3. King. again, i'm a sucker for story build-ups and this coming arc (#77) pushed him up my list because we get some answers, maybe. Bino. Always on-edge about the other dogs, and doesn't care for cats, personality difference also plays a part. I'm not sure, I like tham all but I usually struggle to pick favorites. Interesting question, my good fellow. I shall divide my answer into five categories. I believe I have answered the question in the best way I can. @Shadowstar. I do believe Rick has referred to Fiddler as a dude before. And besides, Fiddler sounds more masculine then keys. The official position is as Brent stated. *shrugs* Okay. But really, it's is to tell who is which gender bypaying attention to their body language, and names. I just think Fiddler is a girl, because every time I see Fiddler, s/he is doing something girly. If you think Fiddler is guy, that is fine. I respect your opinion of Fiddler. Please respect mine of Fiddler being a girl. We will never really know which is which until Rick says so himself. So, until then, lets be friends and have fun and have chocolate cream pie. K? Why is it everywhere I go, when i say something, people think I''m angry?! So, mind sharing the times in which Fiddler seems like a girl? Well....There's the time when on their first date, Max and Grape both saw Fiddler trying to make up her mind on she should order while Keys replied in exasperation. There was also the first time they shown, shortly after Rick started doing everything in color. Keys was trying to think of a day song to play, but Fiddler kept suggesting songs that always had to do with the night. In the end, Keys couldn't do anything but think about night songs. Also, the time during the amusement park arc, the way Fiddler was dancing just seemed like the way a girl would dance. P.S. The pie is lying. P.S.S. Trying not to be stereotypical. My favorite is still King and I love Bailey now as well. Their dynamic is lots of fun to watch. Can't wait to see how they handle Pete's intrusion. I'm pretty sure I don't , but oh well ............. I agree with you that I want to see how King is getting out of this one. It is the current arc that moved Pete up in my Mischievous Do-gooders list.